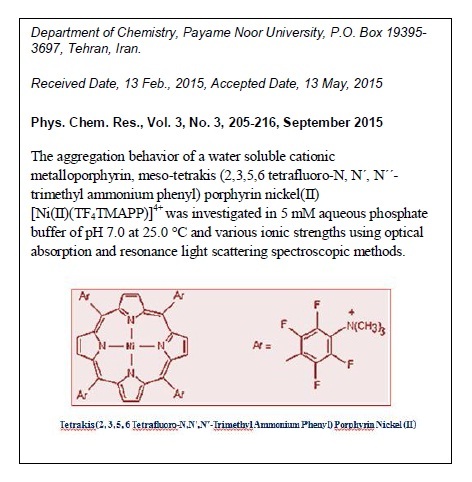 In this study, aggregation behavior of a water soluble cationic metalloporphyrin, meso-tetrakis (2,3,5,6-tetrafluoro-N,N´,N´´-trimethyl ammonium phenyl) porphyrin nickel(II) [Ni(II)(TF4TMAPP)]4+ is investigated in 5 mM aqueous phosphate buffer of pH 7.0 at 25.0 °C and various ionic strengths using optical absorption and resonance light scattering spectroscopic methods. The results suggest that [Ni(II)(TF4TMAPP)]4+ do not aggregate in the experimental concentration range. Also, the interaction of cationic metalloporphyrin, [Ni(II)(TF4TMAPP)]4+ with calf thymus DNA (ct-DNA) is studied in 5 mM aqueous phosphate buffer of pH 7.0 by optical absorption, resonance light scattering (RLS), fluorescence spectroscopy and thermal denaturation measurements. 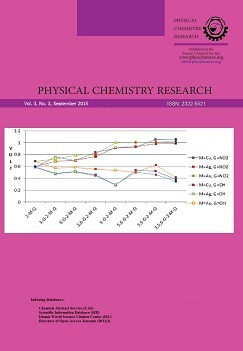 The binding constants are determined by analysis of the optical absorption spectra of the [Ni(II)(TF4TMAPP)]4+ at various temperatures using SQUAD software. The thermodynamic parameters are also calculated by van't Hoff equation. The results indicate that the process is entropy-driven and suggest that the main driving forces are the outside binding mode.